Skill shortages in the UK jobs market have continued to boost pay growth, but with Brexit uncertainty set to persist, we now think it's unlikely to be followed up with a Bank of England rate hike later this year. The key takeaway from the latest UK jobs report is the continued strength in wage growth. At 3.4%, regular pay is growing close to its fastest rate since the financial crisis, and this comes as firms in certain sectors are finding it harder to attract/retain staff. 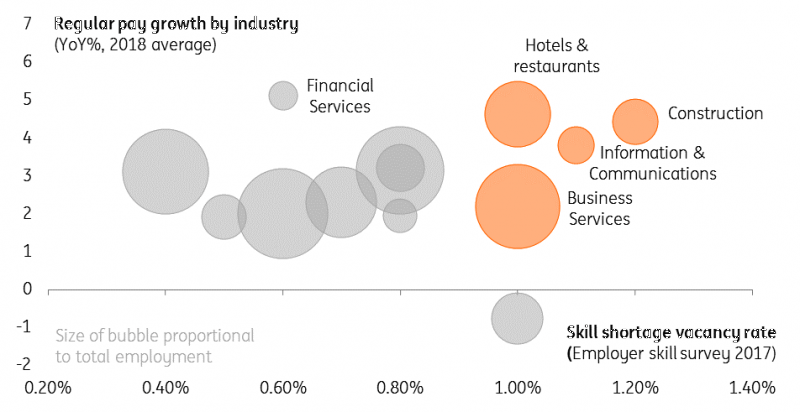 Surveys indicate that skill shortages are particularly acute in the construction, IT and hospitality industries, and this has seen rates of pay outpace other sectors. In principle, there are few reasons to expect this trend to fade imminently, although amid all of the uncertainty, we'd note the number of people on the unemployed claimant count has begun to exceed the number of job vacancies - perhaps a sign of some weakness ahead. For the time being though, rising wage growth should offer some extra impetus to consumer spending, particularly the relatively benign consumer price inflation backdrop. The temporary reprieve from Brexit noise may also help sales of bigger-ticket items, although consumer confidence still remains depressed overall. In the short-run, retailers may also get a boost from the forecasts of decent weather for the Easter weekend. Overall though, we don’t expect a substantial rebound in economic growth over the next few months. The headwinds facing businesses have not faded, and many will need to continue building up their preparations for a possible ‘no deal’ Brexit later in the year. In many cases this will be very costly, and therefore will continue to weigh down overall investment. For that reason, we think it is now pretty unlikely that the Bank of England will hike rates this year – unless some form of deal is approved earlier than most people expect. However if wage growth continues to perform relatively well (which don’t forget has been at the heart of the BoE’s rate hike rationale in the past), then further gradual tightening cannot be ruled out in the medium term.